wow can this be true ? 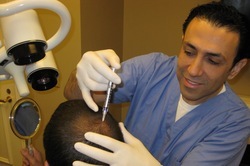 I had 100+ units ($1500 worth, if I remember correctly)of Botox injections to my scalp last February in an effort to relieve tension in my scalp. I did NOT notice ANY regrowth or effect on loss rate. It was a one-time deal for me and I just let the treatment wear off in several months. Maybe you have to use it for several cycles to see the effects on hair loss?? » have to use it for several cycles to see the effects on hair loss?? Isn’t Botox quite toxic stuff? I can think how it may eventually help with hairloss, by improving blood flow and working against fibrosis, but still, this is very far away from a cure. I don’t get how this stuff should be any better than minoxidil. Also the “doctor” mixes it with vitamins, and thats the point where we should get suspicous. What makes hair grow here (if really) is not the vitamins alone , neither the Botox alone (then there would be no need to mix in vitamins), but it just seems so unlikely that the mix of both has any benefit. That means: That guy’s just some poor dude who wants to scam poeple into his expensive botox injections, mixed with “vitamins”. Guys, if you read vitamins anywhere related to hairloss, its most probably just BS. Vitamins are important for your health, but if they would grow hair, we would already know. Last time I read about this they said the results were "unimpressive"
You would think he would have before/after pictures if this worked. Scam…look at these before and after pics of his facial botox…he isn’t even good at faking the before pics. » isn’t even good at faking the before pics. Those pics are almost comical. It kind of makes you think it is a spoof. All the before shots look like the doctor farted in their face. Willy, these photos are “Courtesy of Allergan”. So, if they are fake, they have been faked by botox, not the doctor we now analyze. There is no doubt that these photos are not fair, because the model expression is totally different in the after and before photos. In the after photos, they are provoking the wrinkles on purpose. Love the pic of fckhrls. He’s better looking than I thought…now I am jealous.